Our Patron: St. Gertrude the Great. Died: On a Wednesday of Easter season, 17 November 1302 at the convent of Saint Mary’s of Helfta, Saxony (part of modern Germany) of natural causes. Canonized: Never formerly canonized. Received equipotent canonization, and a was universal feast day declared in 1677 by Pope Clement XII. Benedictine and mystic writer; when she was but five years of age she entered the (alumnate|school) of Helfta. The monastery was at that time governed by the saintly and enlightened Abbess Gertrude of Hackerborn, under whose rule it prospered exceedingly, both in monastic observance and in that intellectual activity which St. Lioba and her Anglo-Saxon nuns had transmitted to their foundations in Germany. All that could aid to sanctity, or favour contemplation and learning, was to be found in this hallowed spot. Here, too, as to the centre of all activity and impetus of its life, the work of works-the Opus Dei, as St. Benedict terms the Divine Office - was solemnly carried out. Such was Helfta when its portals opened to receive the child destined to be its brightest glory. Gertrude was confided to the care of St. Mechtilde, mistress of the alumnate and sister of the Abbess Gertrude. From the first she had the gift of winning the hearts, and her biographer gives many details of her exceptional charms, which matured with advancing years. Thus early had been formed between Gertrude and Mechtilde the bond of an intimacy which deepened and strengthened with time, and gave the latter saint a prepondering influence over the former. Partly in the alumnate, partly in the community, Gertrude had devoted herself to study with the greatest ardour. In her twenty-sixth year there was granted her the first of that series of visions of which the wonderful sequence ended only with life. She now gauged in its fullest extent the void of which she had been keenly sensible for some time past, and with this awakening came the realization of the utter emptiness of all transitory things. With characteristic ardour she cultivated the highest spirituality, and, to quote her biographer, "from being a grammarian became a theologian", abandoning profane studies for the Scriptures, patristic writings, and treatises on theology. To these she brought the same earnestness which had characterized her former studies, and with indefatigable zeal copied, translated, and wrote for the spiritual benefit of others. Although Gertrude vehemently condemns herself for past negligence (Legatus, II, ii), still to understand her words correctly we must remember that they express the indignant self-condemnation of a soul called to the highest sanctity. Doubtless her inordinate love of study had proved a hindrance alike to contemplation and interior recollection, yet it had none the less surely safeguarded her from more serious and grievous failings. Her struggle lay in the conquest of a sensitive and impetuous nature. 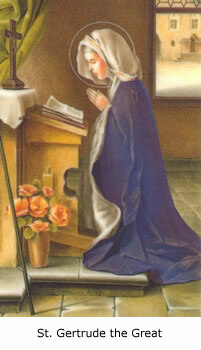 In St. Gertrude's life there are no abrupt phases, no sudden conversion from sin to holiness. She passed from alumnate to the community. Outwardly her life was that of the simple Benedictine nun, of which she stands forth preeminently as the type. Her boundless charity embraced rich and poor, learned and simple, the monarch on his throne and the peasant in the field; it was manifested in tender sympathy towards the souls in Purgatory, in a great yearning for the perfection of souls consecrated to God. Her humility was so profound that she wondered how the earth could support so sinful a creature as herself. Her raptures were frequent and so absorbed her faculties as to render her insensible to what passed around her. She therefore begged, for the sake of others, that there might be no outward manifestations of the spiritual wonders with which her life was filled. She had the gift of miracles as well as that of prophecy. When the call came for her spirit to leave the worn and pain-stricken body, Gertrude was in her forty-fifth or forty-sixth year, and in turn assisted at the death-bed and mourned for the loss of the holy Sister Mechtilde (1281), her illustrious Abbess Gertrude of Hackeborn (1291), and her chosen guide and confidante, St. Mechtilde (1298). When the community was transferred in 1346 to the monastery of New Helfta, the present Trud-Kloster, within the walls of Eisleben, they still retained possession of their old home, where doubtless the bodies of St. Gertrude and St. Mechtilde still buried, though their place of sepulture remains unknown. There is, at least, no record of their translation. Old Helfta is now crown-property, while New Helfta has lately passed into the hands of the local municipality. It was not till 1677 that the name of Gertrude was inscribed in the Roman Martyrology and her feast was extended to the universal church, which now keeps it on 15 November, although it was at first fixed on 17 November, the day of her death, on which it is still celebrated by her own order. In compliance with a petition from the King of Spain she was declared Patroness of the West Indies; in Peru her feast is celebrated with great pomp, and in New Mexico a town was built in her honour and bears her name. Some writers of recent times have considered that St. Gertrude was a Cistercian, but a careful and impartial examination of the evidence at present available does not justify this conclusion. It is well known that the Cistercian Reform left its mark on many houses not affiliated to the order, and the fact that Helfta was founded during the "golden age" of Cîteaux (1134-1342) is sufficient to account for this impression. The "Liber Specialis Gratiae" of St. Mechtilde. The works of St. Gertrude were all written in Latin, which she used with facility and grace. The "Legatus Divinae Pietatis" (Herald of Divine Love) comprises five books containing the life of St. Gertrude, and recording many of the favors granted her by God. Book II alone is the work of the saint, the rest being compiled by members of the Helfta community. They were written for her Sisters in religion, and we feel she has here a free hand unhampered by the deep humility which made it so repugnant for her to disclose favors personal to herself. The "Exercises", which are seven in number, embrace the work of the reception of baptismal grace to the preparation for death. Her glowing language deeply impregnated with the liturgy and scriptures exalts the soul imperceptibly to the heights of contemplation. When the "Legatus Divinae Pietatis" is compared with the "Liber Specialis Gratiae" of St. Mechtilde, it is evident that Gertrude is the chief, if not the only, author of the latter book. Her writings are also colored by the glowing richness of that Teutonic genius which found its most congenial expression in symbolism and allegory. The spirit of St. Gertrude, which is marked by freedom, breadth, and vigor, is based on the Rule of St. Benedict. Her mysticism is that of all the great contemplative workers of the Benedictine Order from St. Gregory to Blosius. Hers, in a word, is that ancient Benedictine spirituality which Father Faber has so well depicted (All for Jesus, viii). The Church has inserted the name of Gertrude in the Roman Martyrology with this eulogy: "On the 17th of November, in Germany (the Feast) of St. Gertrude Virgin, of the Order of St. Benedict, who was illustrious for the gift of revelations."